Call Rebecca @ Sheffield Wedding Celebrant on 07528637825 or use the contact form on this website to email me. I am a Sheffield Wedding Celebrant and can officiate at ceremonies carried out anywhere, the venue doesn’t need to be licensed. Having a wedding ceremony or civil partnership led by a celebrant gives you the freedom to hold your ceremony wherever you like and at any time of day. The setting creates a special atmosphere and gives your Wedding a truly unique flavour. 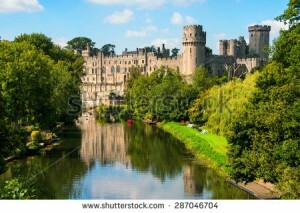 I can conduct weddings in castles, picturesque woodlands, lakeside settings, stately homes, hotels, beautiful gardens, barns, tipis, marquees, rooftops and even on a beach! The possibilities are endless and the venues don’t need to be licensed. As with any standard wedding ceremony, you can include the traditional elements by saying ‘I do’ but what makes the service personal is that you can also write your own wedding vows, select your own music and create your own sequence. 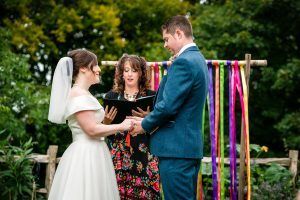 Although most people still choose to exchange vows and rings, you can also include other symbolic elements such as handfasting, unity candle, unity sand, breaking the glass, broom jumping and warming the rings. In addition you can bring in a ceremony devised around something meaningful to you as a couple. The style of the ceremony will be written by the wedding celebrant to reflect the couple’s personalities so it could be sentimental and romantic or humorous and irreverent, whatever the case it will based upon your wishes. I can incorporate faiths and cultural heritage as well as spiritual elements, there is no restriction. As a Sheffield wedding celebrant, I often like to include family and children as their participation adds to the occasion. This service is open to everyone regardless of faith, cultural background or sexual orientation. However, it will be necessary to arrange the legal part of the wedding ceremony. For the marriage to be recognised in law the “Declaratory Words” and the “Contracting Words” need to be said in a Registry Office or licensed venue for a marriage certificate to be issued. Many people are unaware that ONLY these 41 words listed below have to be said in a Registry Office or licenced venue, in order for your marriage to be recognised in law. The remaining ceremony can be left to your imaginations. These words can be exchanged within 10-15 minutes in a registry office either on the morning of the wedding, during the day(s) before or at some point after the ceremony. A few years ago the government introduced a scheme to offer a civil wedding ceremony as an alternative to a religious ceremony or church wedding. If you choose to book myself at Sheffield Wedding Celebrant, the cost of the ceremony starts at £395.00 and varies upwards depending on how many additional symbolic elements you wish to include. These can be negotiated at the home visit. There would be travel costs added if the venue was outside Sheffield. The departure of the couple.